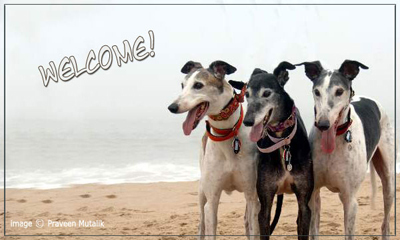 The Greyhound Project produces wall and desk calendars as a fundraiser for adoption groups, and about 10,000 are purchased annually. Each photo caption identifies the dog, adopter, and agency, and we send a free calendar if your photo(s) are selected. The deadline for 2020 photos has passed, and the winners will be announced on Facebook in June. Many thanks for submitting so many beautiful photos! We have some ideas for spreading the word. Greyhounds make fantastic pets, but they are not for everyone. Learn the facts about these slender athletes as you explore our site. Published from 1996 through 2017, each issue of Celebrating Greyhounds contained more than 50 beautifully designed pages of feature stories, humor, poetry, and photographs that explore the many ways these dogs are integrated into our lives. Make a donation to support The Greyhound Project's mission, and as our thanks you'll receive full access to every interactive digital issue. We are in the process of making all back issues, including print issues, available online. Click on the link below to preview recent issues.